The DR Versa-Trailer is a must-have accessory for ATVs and UTVs, as well as compact tractors. This new utility trailer can is the first of its kind to offer a pivoting boom-lift for power loading and unloading. DR® Power Equipment today introduced its new DR® Versa-Trailer utility trailer by challenging consumers to test the new product’s “metal” with a unique trial offer. During the month of March, DR® Power Equipment will offer a special 1 year hands-on trial to anyone who purchases the Versa-Trailer directly from DR® Power by March 29, 2012. The DR® Versa-Trailer is a must-have accessory for ATVs and UTVs, as well as compact tractors. This new utility trailer can haul loads up to 2,000 pounds and is the first of its kind to offer a pivoting boom-lift, which makes loading and unloading heavy loads almost effortless. 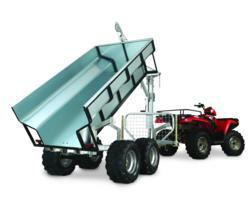 Consumers who take the “Test our Metal” challenge can try out the new galvanized ATV dump trailer for 1 year from its ship date, and if they are not fully satisfied with the trailer’s performance, they can simply send it back for an exchange or a full refund of the product’s original price, less the standard shipping charges. On top of its all-steel construction, the new utility trailer features the world’s first boom-lift that pivots to lift up to 440 pounds on either side of the trailer. The boom-lift can also be used to raise and lower the galvanized steel bed, which resists dents and rust. The bed itself can be removed (no tools required), quickly converting the trailer to a stake bed for harvesting trees or hauling long loads. The trailer’s tandem wheels, which pivot on a single axle, allow it to “walk” over uneven ground, so owners can take it anywhere their ATV, UTV, or compact tractor will go. And unlike most poly or wooden ATV trailers and dump carts, the Versa-Trailer was designed with a rearward pivot point, which achieves a 35 degree dump angle for clean unloading every time. Michael Johnston, DR® Power Product Manager, said that he knows consumers will find the new trailer as rugged and versatile as he did testing it on his ten acre farm when he first evaluated its all steel construction and design. DR® Power Equipment, a division of Country Home Products, Inc., the premiere developer and marketer of professional-grade outdoor equipment for residential use, was founded in 1985 in Charlotte, Vermont. Today it occupies three facilities and employs 220 people. For more information on its complete line of power equipment and home care supplies, visit the web site at http://www.drpower.com. PRODUCT PHOTOS AND DEMONSTRATIONS ARE AVAILABLE. DR® Power Equipment sells products factory-direct and through a network of over 500 dealers; a free catalog can be ordered at 802-877-1200, or obtained online at http://www.drpower.com. For more information on DR® POWER EQUIPMENT, please contact Marcus Certa at: mcerta(at)chp(dot)com.